Underwater photography is a pretty interesting and challenging photography area for shutterbugs as it offers the possibility of many exhilarating and rare photographic opportunities. Taking excellent underwater shots does not only rely on the photographer’s technique but also very much on the equipment. Besides the underwater camera, the underwater flash or strobe which is often regarded as one of the most challenging elements of underwater photography is an important supplementary tool to produce good quality underwater photos. To supplement its wide range of digital compact cameras and underwater housings, Fujifilm has rolled out a new underwater flash kit, Fujifilm Remora Flash, which will give extra boost to underwater photographers. The Fujifilm Remora Flash Kit features a Remora Flash unit with a guide number of 20, a flash beam angle of 60 degrees, a flexible arm and a fibre-optic cable. The wide angle flash beam and flexible arm offer photographers a wider flash coverage and more flexible positions to take difficult shots. With a guide number of 20, the underwater flash offers photographers more flexible lighting control and is suitable to use in either daytime underwater photography or night shootings. Powered by 4 AA batteries, the flash facilitates underwater photographers up to 180 feet in depth in photo shootings. 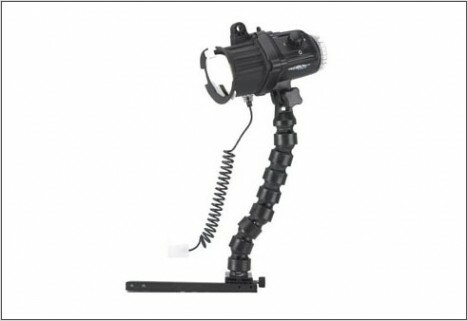 The underwater flash kit is priced at £229.